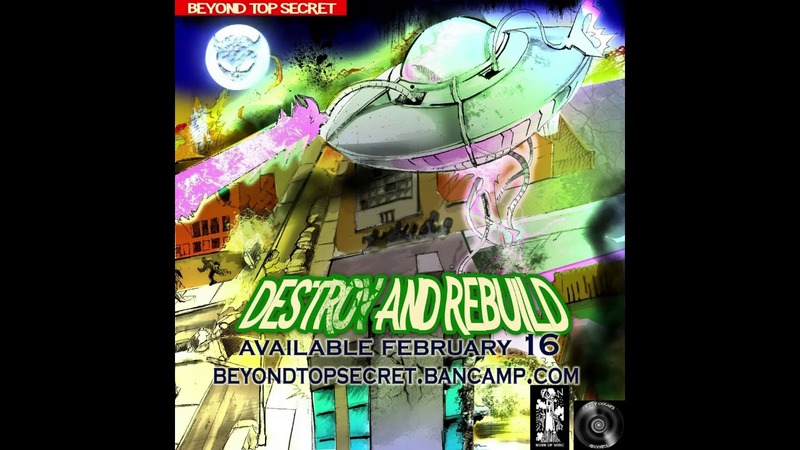 Mercy Counts Records has once again managed to deliver a near classic underground album with Beyond Top Secret’s latest release, Destroy & Rebuild. Bringing together Freeze, Xplizt and DJ Docta Damnage to create a whirlwind force that delivers an unbelievably powerful album. If you haven’t checked out my latest interview with them, make sure to click this link —> Beyond Top Secret Underground Spotlight interview. While Mercy Counts Records has been home to both Freeze and DJ Docta Damnage for around a decade, they’ve worked with Xplizt for a number of years as well. This isn’t some flash in the pan, fly by night project, these monsters are here to stay and they put a stamp on it with this album. I won’t go into much more about the members themselves and what has transpired to get them to this point, because you can always check out the interview. So, you definitely should check that out… just saying. Besides, this is an album review. So, I say it’s about time we take a look at “Destroy and Rebuild” itself, shall we? The “Intro” track does a great of setting the pace for the fire that is set to be lit by the rest of the 17 tracks coming. If you’ve ever read any of my reviews, you know I’m not really a fan of intro tracks, but this one actually does a great job. It’s short, impactful and to the point. Starting with some other worldly style that slams its’ transition into a broadcast of sorts that talks about an alien invasion. The sticking point though is the line in which they confirm that this species has come to destroy and rebuild in their own image. At this point the album slams into full gear and “Who” kicks things off by slowly easing you into everything and still managing to showcase the talent these artists bring to the table. Once the next track “Area 51” hits the speed has picked up significantly, but Freeze, Xplizt and Damnage prove that they can handle any style thrown their way. Tracks like “Criminal, Wicked, R Kelly” and several others pound the speakers while also delivering this more fast paced style. Each one is a great way to get the juices flowing and the blood pumping, which is a nice balance to some of the slower and even some of the heavier horrorcore tracks. I always love when an album takes you on a journey and offers you a nice pacing with the tracks themselves. It’s always obvious when an album has been thoughtfully put together, when you can literally feel the time and process that went into the track arrangement on the album itself. This is something that I have to pause briefly to highlight as I find it to be an important part of any album. If you can switch up your flow, beats and slow things down while also raising the hype when it’s necessary is an art in itself. As a counter balance to the above mentioned tracks as well as many more I didn’t cover, we also get blessed with songs like “Sermon,” which is slower and has an amazing vibe and message. Now, remember just because I say things slowed down, doesn’t mean the fire isn’t still spitting from these powerful emcees. Freeze Martian, Xplizt and Damnage are strong and solid as usual, bringing some creeping horrocore for you. “Light Beam,” is another welcome addition of some change with a nice guitar backing track that seems to push quickly, but somehow still invokes a haunting vibe that carries through each verse. While I’d love to cover every track, I’ll let you check out the surprises for yourself. I do have to stop and make a special mention of the utterly brutal “Slasher.” While this track comes near the end of the album it manages to deliver some of the most vicious lyrics on the entire album. This is also a track that I believe is the best example of everything coming together perfectly. The music hits hard, delivers that eerie feeling and shows that this group is here to claim a spot at the top of the horrocore genre. The following track, “All That’s Left,” seems to continue the flow of the previous track and it just feels nice that at this point we are full gear, knowing the end is coming. “Tired,” closes things out in a beautiful way, but once again giving us a switch up and drops what may be the best hook I’ve ever heard Freeze record. Again, don’t get me wrong here, if you know Freeze Martian then you definitely know his versatility, but this chorus is so wonderfully paired with this track. It is a great way to end a rollercoaster of an album that truly never gives you a chance to breathe. I mean that in the best imaginable way possible. Sure we do have the entertaining,”Breaking News Skit,” which actually fits nicely and continues the trend set by the intro, but throughout the album we have some slow, fast, banging and some nasty as hell tracks. If you haven’t checked out any of the artists from their solo careers, I recommend that immediately after you pick up “Destroy and Rebuild.” These artists are putting the scene on alert and letting them know that there is a force of horrificness brewing in the underground that will not be overlooked. Trust me, after you give this album a listen, you won’t want to stop and you will see why Beyond Top Secret is about to make massive waves.